This will be our 27th year for Tour Nebraska ----June 1st and 2nd - Our host city for this event will be Kearney Nebraska. Interest and registration for Tour Nebraska 2018 has been so strong that for the second year we have been required to impose a limit of 400. That limit was reached on March 29th. You may still register and will be given an opportunity to be placed on our waiting list in we determine that more can be taken without sacrificing the quality of the Tour. 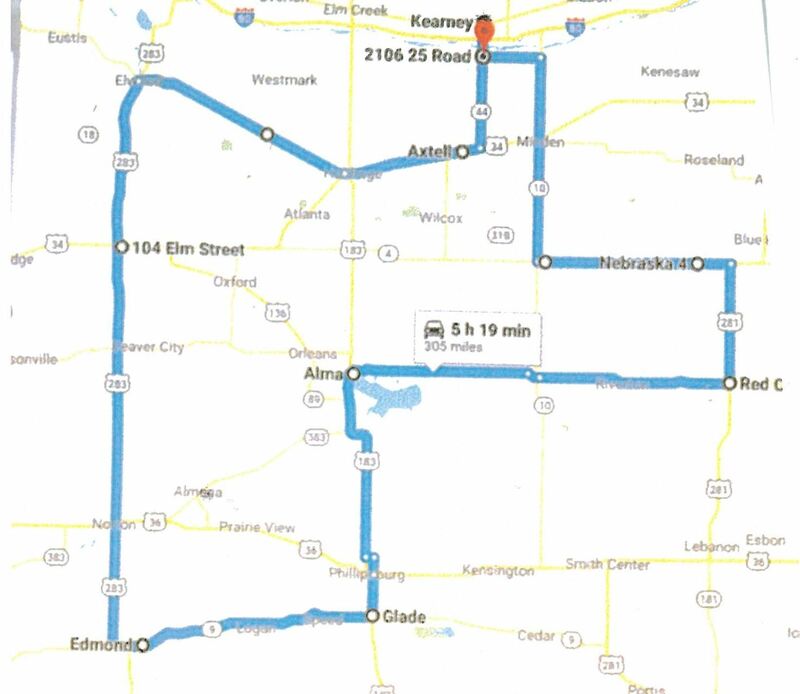 Tour Nebraska is a unique "driving event" covering 600 miles in two days. This is not a car show, and there are no trophies - we believe everyone who participates is a winner. It always held on the first week end in June that contains any day in June.It is open to all 4 wheel vehicles - 30 years old or older. So, for 2019 we will accept vehicles 1989 and older. The event has been held for 26 years and the record for participants stands at 484 in 2018 when we started in York. We do set an entry limit based upon the accommodations we have arranged for in the various towns we will be stopping in. For the past two years we have reached that limit and unfortunately had to cut off registration early. Tour Nebraska is a NRCA members only event, however, non-members are encouraged to join the association and participate. Tour Nebraska is a great value - only $30 and you get one high quality T-shirt - additional shirts are $15 (xxxL is $18) and we also produce a DVD of the even for $12. Proceeds from the DVD help support our scholarship fund for Nebraska tech schools students in an automotive curriculum. We refer to it as an "adventure" rather than a trip and most likely you will go to places that you would not have seen otherwise. The first day starts in our host city at 6:30 in the morning with a driver's meeting to get any last minute instructions. For safety reasons, we break the tour into two groups. Each group has at least two tour leaders and the groups are separated by about 15 minutes. Breaks and receptions are scheduled in communities each morning. We also have a noon break and a catered lunch for those who are interested. Generally, we will travel close to 200 miles in the morning up to the lunch stop and then roughly 100 miles back to our host city by about 3:30. The host city changes each year and we try to work closely with host clubs to provide for local needs. On Saturday evening we have a costume party with a live band, dance floor, open bar, and a lip sync contest. Each year we have a party theme --- in 2018 it was "Western" Since we will getting up early on Sunday, we shut our party down early at 10:30. Sunday finds us assembling again at 6:30 and during our short program we say goodbye to our host city and club. Then at 7:00 we are off on another 300 mile adventure that will end with a final reception. Tour Nebraska is a " members only" event but you can join NRCA as a step in the registration process. Registration opened January 1, 2019. We have set a limit based on the facilities we will be using and that limit was reach on March 7th. Registration is now closed. Got a question about the Tour? Check out Tour Nebraska on Facebook too -- click on link below to go there.